Edited: The winner of two free spots to my class is MoonGirlArt. Thank you to everyone who participated! I'll see you in class. It's time for a give away. 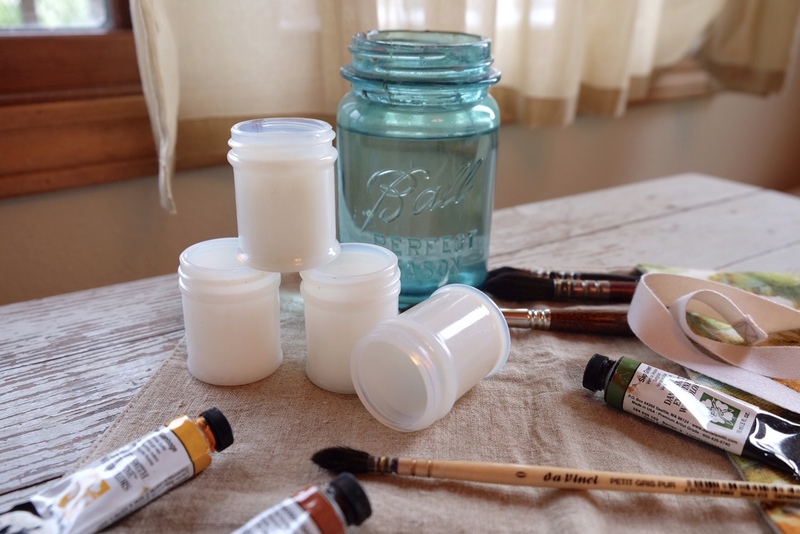 I want you to take away so much good stuff from my upcoming class called Close To Home: A Watercolor Landscape Journey. I'd love for you and a friend to be able to take my class together. Whether you live next door or across the Earth, you can both enjoy the class through the magic of the Internet. You can enter on Instagram and earn an extra chance through a blog post. To qualify: For Instagram, post any promo photo from my Instagram account (MishWooderson)or here on the blog where I talk about my class on your Instagram account. Tag me and your friend (or list their name if they don't have an account). If blogging, provide a link to my blog post where I talk about my class and any photo where I promo my class, either here or on Instagram. Feel free to link to Jeanne Oliver's website also. I want to hear good stories about why you and your friend would love to take my class together. Just make sure you link me up to your entries. I'll select a winner in a week, July 13th. Look for the winners here on the blog and on my Instagram account. Here's just a small preview of the type of projects we'll be working on. Lots of sketching and experimenting and filling those sketchbooks. Hope to see you in class. I also have a few fun art items added to my online shop. I love using vintage butter pat dishes to mix paint combinations and to hold mediums like gesso or acrylic paints. 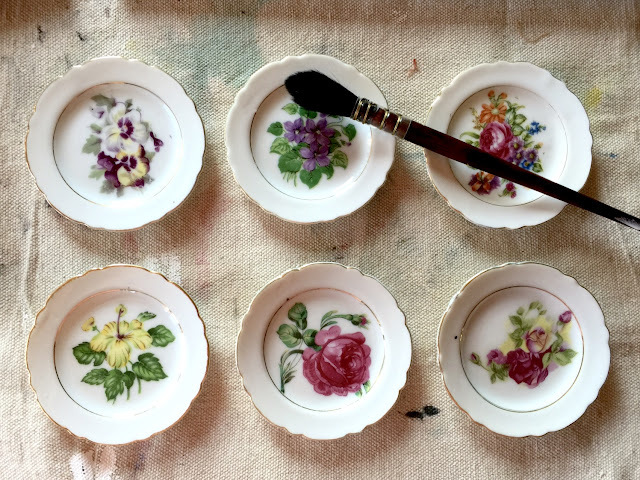 This cute little floral set is stackable and perfect for adding a bit of charm to your studio. I have just a few of these paint palettes left. They are my favorite in studio palette for watercolors because they are big and have plenty of space for pigments and mixing washes. As I purchase better and usually more expensive brushes, I'm finding that I want to take better care of them also. 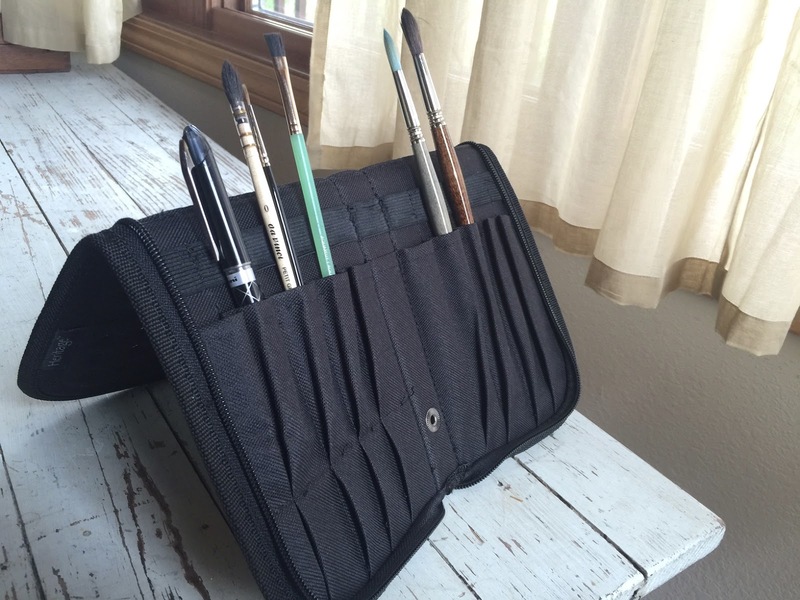 My regular size brushes are housed in a folding, zipper case somewhat like the one below. 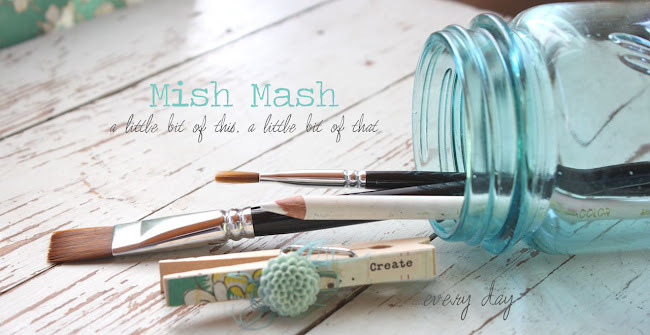 You can zip it up, throw it in your bag or work basket in your studio and know that your brushes are protected. Hi guys! 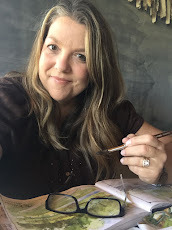 I'm back today to share more about my class over at the Jeanne Oliver Creative Network called Close To Home: A Watercolor Landscape Journey. I've been sharing on Instagram and Facebook a few more sneak peeks and will share more here on the blog as well. 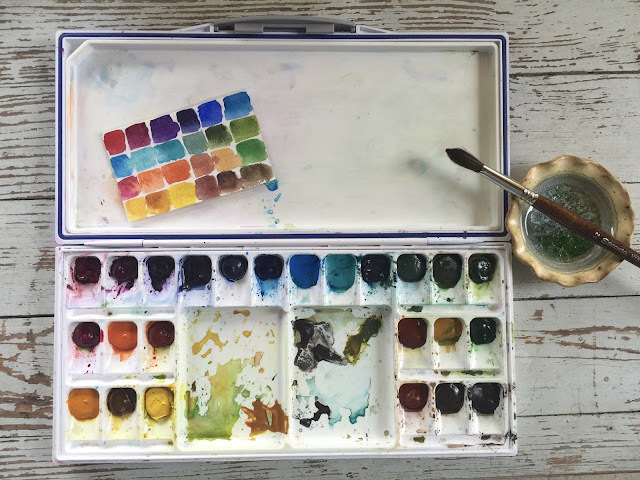 I will take you through the basics of setting up a watercolor travel palette, discussing which watercolors are best, what half pans are and will show you several types of watercolor palettes that I own and like to use. 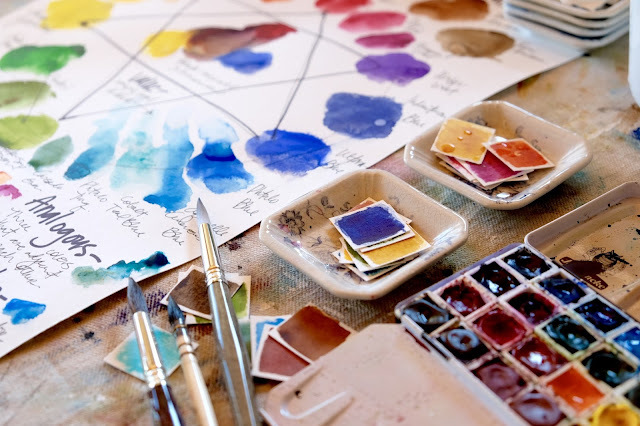 At the registration page on Jeanne's site, I also have my supply list available which includes my current 24 colors of watercolor paints that are in my palettes. Just follow through the link above and click on my class within the blog post. From there you may have to register on Jeanne's site, then will be able to access the class sign up. You can see the supply list without signing up though. That way you can tell what supplies you might need if you're interested in the class. I'll also be revisiting/introducing the color wheel theory and we'll create a beautiful color wheel that will be like a piece of artwork in your studio. You can reference it time and again and I'll give you some tips on how to easily reproduce your color wheel to keep with you at all times. There's been lots of excitement and many of you signing up for the early $28 registration price. Thank you! I hope you'll join me as there is LOTS to learn. Whether you are an experienced painter or just a beginner, this will class will be perfect for you. Can't draw? That's okay because the landscapes that we'll be using as references are simple enough that just a few lines are all that are needed. We will build upon the lessons we learn as we get through the 4+ hours of videos. You can access the videos and watch them at your leisure, again and again. I'll be back with more fun details of the class soon. If you have Instagram I am MishWooderson and my Facebook page is HERE if you want to follow along with more frequent posts of mine. Thanks as always for stopping by and I hope to see you in class!